It was the end of the day on Friday, Feb. 12, when the City of Sarasota announced that less than a year after he was hired, Doug Logan would be leaving his post as the director of special initiatives on chronic homelessness. His departure was coming amid concerns about compliance with the state’s open government laws. “The City of Sarasota and Mr. Logan agreed to a mutual separation after it was determined his endeavors to help create a private nonprofit Housing First organization would be legally challenged under current interpretations of the Florida law,” said a press release city staff sent out on Feb. 12. Just days later, on Tuesday, Feb. 16, city leaders took steps to try to ensure that future opportunities to solve homelessness issues through the private sector would not be vulnerable to legal action under the state’s Sunshine Laws. To achieve that, the city commissioners unanimously approved a motion to disclaim any relationship with a 501(c)(3) nonprofit organization should one be established to support a Housing First initiative in the community, even though Logan had suggested the idea publicly during his tenure with the city. 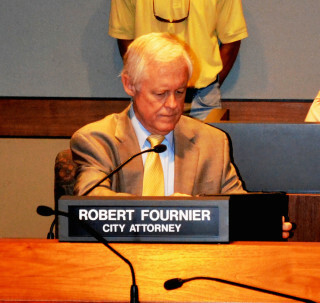 Essentially the motion, made by Commissioner Susan Chapman, was aimed at “undoing what has been done” during Logan’s tenure in regard to formation of a nonprofit, said City Attorney Bob Fournier. Logan’s departure is effective as of Monday, Feb. 29, according to a Feb. 12 letter he sent to City Manager Tom Barwin. He and Barwin agreed beforehand that the work of the nonprofit entity proposed to tackle the city’s homelessness issues likely would have to comply with the state’s public records and open meetings laws because he as a government employee, had facilitated its creation. City Attorney Robert Fournier said Chapman’s Feb. 16 motion legally helps clear the way for a new nonprofit should a group of private individuals wish to form one. Such an entity may still work with the city, he pointed out, but city government needs to make it clear that it has no role in the creation of the organization. Fournier also referenced media reports that have included names of individuals who might be involved in such a nonprofit. “This just gives the people named so far the protection they deserve,” he added of the motion. Still, he noted, any group created in an advisory capacity for the city would be subject to Sunshine Law transparency requirements. A nonprofit organization has been seen as a means of connecting philanthropists in the community to the effort to reduce homelessness, especially through a Housing First program, which the City Commission has supported as a priority over a come-as-you-are shelter. 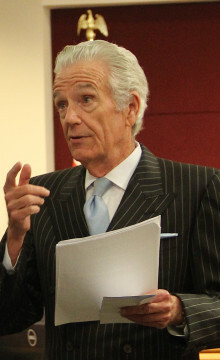 Fournier made it clear the board’s move was aimed at dissolving any ties to a nonprofit formed under Logan’s aegis, since that group could be “vulnerable” to a potential Sunshine violation lawsuit. “That is not to say you wouldn’t work with a [nonprofit] entity,” Fournier said. “We are deeply invested in Housing First,” Alpert emphasized. Commissioner Shelli Freeland Eddie said she did not want to close the door on a future opportunity that might involve a nonprofit. She added that she also did not want philanthropists to worry about whether records of their contributions might be made public through a legal challenge.